Pink Gazelle Productions: Authentic Lives…Authentic Works » Putting It Off; What Is Procrastination Telling You? 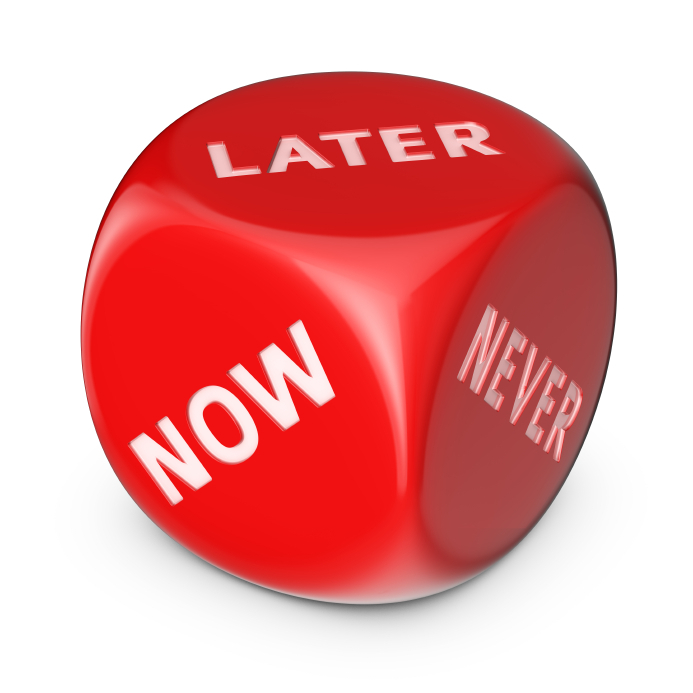 Putting It Off; What Is Procrastination Telling You? Putting It Off…What Is Procrastination Telling You? Yikes! Let me tell you, I did NOT like the feeling I got when I read that quote the other day. But it certainly got me asking myself some uncomfortable questions about why I seem to be procrastinating on projects and goals that are, supposedly, important to me. Perhaps one way to tell if we are, indeed, procrastinating on a task or project is to ask ourselves the feeling we get when we think about it. “We know that we have things that need to be done, and the more we think about them, the more leaden we feel,” writes Anne Wilson Schaef in her book, Meditations for Women Who Do Too Much. The word “leaden” denotes a feeling of heaviness – and there’s nothing quite like the dead weight of an unattained goal or unachieved dream to drag one’s soul down. So if I do feel leaden when I think of all the tasks I need to do in order to move, say, a writing project forward, the logical next question would be: if I did just one task, would that make me feel lighter? Or would I feel lighter if I just delete the damn task from my to-do list – and get on with tackling the tasks I do need to accomplish before I die? Or perhaps keeping the task right where it is, on the back burner – for now – feels like the wisest course of action? However, if we do happen to care deeply about getting a task done, a project started or a goal or dream accomplished, then we may need to ask ourselves why, year after year, we don’t put it – or small steps towards it – anywhere near the top of our daily to-do list…or on the front burner, as it were? Perhaps it’s because of all the other tasks that must get done to keep ourselves/ lives/homes/families/businesses/communities/planet functioning? There’s certainly no shortage of tasks that need to be completed – hence all the incredibly busy people out there, running around like chickens with their heads cut off doing every other task on their to-do list except the one thing their soul needs them to do. The paradox, of course, is that in order to determine what that thing is, one must actually stop whirling for more than 30 seconds and just sit quietly and listen to the soft whisper of one’s soul. More on this in my blog, Sweet Solitude – Why Time Alone to Quiet the Soul is Important. Or perhaps it’s the “all or nothing” syndrome whereby you figure there’s no point in writing 15 minutes a day on your novel when what you want is a year. Why? Because the real purpose of pursuing a dream isn’t about achieving it. Rather, it’s the process of pursuing it where the magic lies. Yes, completion is important – absolutely. But the timing of that, in my experience, is often beyond our control. And as humbling as this is for me to admit, if I haven’t completed a specific screenplay, play script or book manuscript yet, that’s because I still have more to learn from the process of writing it. And that means that all my other, equally important, writing projects will just have to simmer on the back burner a little bit longer. I’m glad I came across the quote that made me squirm because it confirmed that I do, eventually, want to achieve all the things I have set out to achieve in this life. But what I was thought was procrastination may, in fact, be the wisdom that comes as a result of life experience. Some goals, soul-important as they may be, do need to get set aside for awhile because other equally important goals need to get tackled first – probably because what we need to learn from the process is necessary for the future! Here’s a powerful anecdote to illustrate this: two days after my Mom passed away, I found myself in a framing shop with my niece Melanie, who is an incredible artist. She needed to drop off two of her paintings for framing – and I just happened to be in the car with her. Inside the frame shop, we got chatting with the owner, who is also an extremely talented painter. He showed us one of his paintings. Thanks. I always like to get things done. But after reading that I guess I do procrastinate over some things in my life. Here’s to achieving more of my goals.